HOUSTON (CN) – A Texas school district board has agreed to spend more than $1 million to fortify Santa Fe High School before students return in August in response to the recent shooting there that left 10 people dead. Santa Fe Independent School District oversees two elementary schools, a junior high and a high school with a total enrollment of more than 4,700 students in Santa Fe, a Galveston County city 35 miles southeast of Houston that got its name from the former operator of a railroad that bisects the city. Santa Fe ISD’s board on Tuesday night approved $650,000 for panic buttons for the high school, $150,000 to place locks inside classrooms and $250,000 to remodel the school entrance, which will entail expanding the school’s lobby so visitors can be vetted and approved to enter the campus by staffers behind bulletproof glass. The board nixed an $180,000 proposal to install a 6-foot fence around the high school, local media reported. Though Texas Lieutenant Governor Dan Patrick announced July 2 that with the school board’s approval he will donate 10 metal detectors to the school district, metal detectors were not on the agenda for Tuesday’s meeting, Houston’s ABC affiliate KTRK-TV reported. Santa Fe ISD plans to finish most of the upgrades in August in time for the 2018-2019 school year. The lobby renovation will be completed in September, school officials said. On the morning of Friday, May 18, a Santa Fe High School student wearing a trench coat walked into a first-period art class with a sawed-off shotgun and a .38 caliber handgun and fatally shot eight students and two teachers, and wounded 13 others. Police arrested Dimitrios Pagourtzis, 17, after reportedly trading gunfire with him for 30 minutes. Pagourtzis, who had posted a photo of himself on social media in April wearing a T-shirt proclaiming “Born to Kill,” is in Galveston County Jail facing 10 capital murder charges and several counts of aggravated assault. Due to his age, Pagourtzis is not eligible for the death penalty. Two days after the shooting, the suspect’s father, Antonios Pagourtzis, said during an interview with a Greek TV network that he was the registered owner of the firearms, and that his son had taken them from his closet. Pagourtzis’ father was sued by the parents of a student killed in the shooting but has not been criminally charged. Texas Governor Greg Abbott reacted quickly to the tragedy, unveiling a plan on May 30 in which he recommended that state lawmakers change criminal statutes so parents in Antonios Pagourtzis’ shoes could be prosecuted for not safely storing their guns. Texas parents can be charged with a misdemeanor if their children are 16 years old and younger and commit crimes with their guns. Abbott wants to expand the law so parents of 17-year-olds can also be charged. 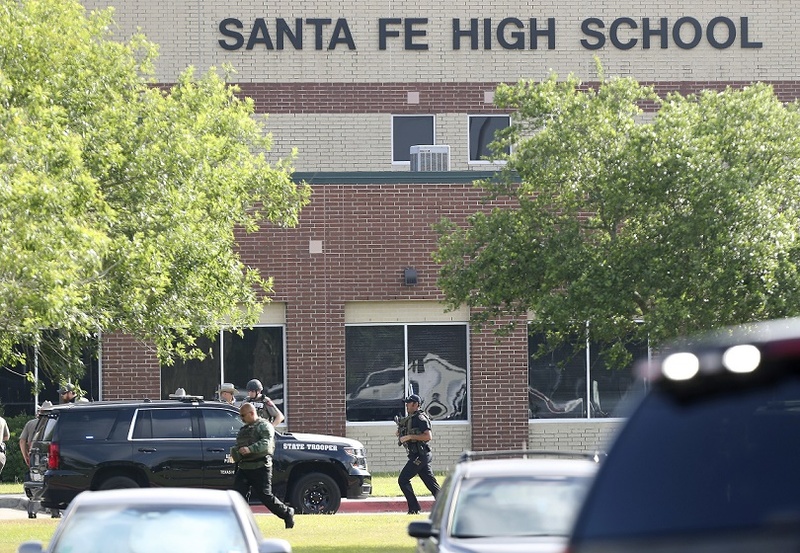 Santa Fe ISD’s vote to fortify its high school comes in the wake of two children in Greater Houston shooting themselves within the past week. A 2-year-old unintentionally fatally shot himself in the head with his father’s 9mm pistol on Sunday in his Houston home while his parents were in the house, local media reported. The 4-year-old stepson of a Harris County sheriff’s sergeant is in critical condition after accidentally shooting himself with a handgun at his suburban Houston home Tuesday night, Harris County Sheriff Ed Gonzalez said. Gonzalez has not revealed the sergeant’s name. Though Texas prosecutors can charge gun owners with a misdemeanor if a child younger than 17 gets their hands on a loaded gun the owner did not safely stow, Harris County prosecutors have not charged the 2-year-old boy’s father over his death, court records show.